Six Flags America today announced the addition of its 10th roller coaster, Bourbon Street Fireball, which will stand a stunning seven stories tall and reside in the new Mardi Gras section of the park. 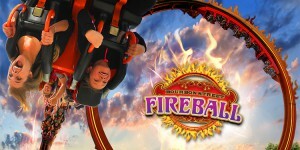 Bourbon Street Fireball is one of three new roller coasters to be added to the park in four years. In 2014 Six Flags America added its ninth roller coaster, Ragin Cajun. Apocalypse, Maryland’s only standing roller coaster, was the parks eighth roller coaster and it opened in 2012.